For the Roasted Beef Tenderloin: Preheat the oven to 400ºF. Line a baking sheet with a wire rack and set aside. Peel most of the papery skin off of the garlic heads, then cut about 1/4-inch off of the top of garlic heads and discard. Place the 2 exposed garlic heads on a piece of foil, drizzle evenly with 1 tablespoon of olive oil and wrap them up tightly. Roast in the oven until garlic cloves are completely caramelized, about 40 minutes. When cool enough to handle, squeeze the roasted garlic into a medium bowl and mash in to a paste and stir in a 1/2 tablespoon of olive oil. Rub the beef all over with the garlic paste and season with salt and pepper to taste. Place the tenderloin on the prepared baking sheet and roast until medium rare, when the internal temperature reaches 125ºF, about 25-30 minutes. Meanwhile, tie the thyme and rosemary together with butcher’s twine, creating a brush. Periodically, throughout the roasting process, dip the herb brush into a small bowl with 2 tablespoons of olive oil, and baste the tenderloin. Remove from the oven and allow to rest for at least 10 minutes before slicing. For the Pear and Arugula Salad: In a large mixing bowl, whisk together the Dijon mustard, honey and white balsamic vinegar. Season with salt and pepper then drizzle in 1/2 cup of olive oil, whisking to combine. Add the arugula, onion and pears to mixing bowl and toss to coat the salad. 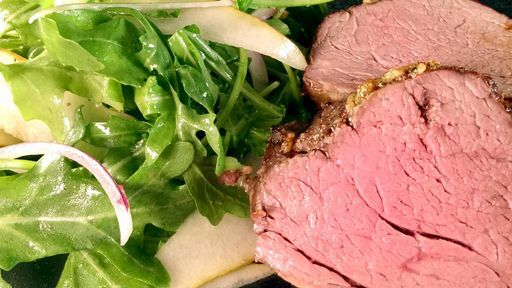 Serve the sliced tenderloin with the salad on top or alongside the beef. Tip: Throw leftovers between some crusty bread slices for a delicious next day lunch!